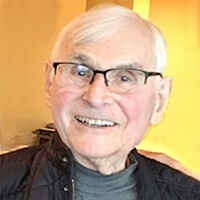 Rosenbloom, Amos age 89, of Edina, died April 19, 2017 in the comfort of his home. Predeceased by parents, Esther & Eli Rosenbloom, brother Noah Rosenbloom (Janet), New Ulm & sister Maanit Tsoran (Willie), Kibbutz SaSa, Israel. An Air Force veteran of the Korean War; a visionary and mentor in the insurance industry (formerly a partner of BHK&R and most recently Rosenbloom & Rosenbloom and Bearence Management Group); and an inductee in the State & National Raquetball Halls of Fame. Survived by loving wife of 21 years & dedicated caregiver, Marsha McDonald; children Jody (Joel Kaminsky) of Massachusetts, Susan (Joe Black) of Colorado & Philip (Tammie Singer); grandchildren Eli, Elana, Maya, Eden & Ethan; former wife, Reva Rosenbloom; families of sisters-in-law Mary Karkela and Theresa Nelson, and many loving relatives and friends. A special thank-you to his team of caregivers. Memorial service to be held Sun, May 7, 2:00 p.m. at the MN Landscape Arboretum (MacMillan Aud.). Shiva at 7:00 p.m on May 7 at the Point of France and Monday, May 8 at the home of Philip and Tammie Rosenbloom. In lieu of flowers, memorials preferred to: Wilderness Inquiry, the Sabes JCC, or the Minnesota Landscape Arboretum.